In one of the bravest performances from a GR trained horse, Battle Hero was first up from a spell and first home in the Listed Summer Scorcher at Ascot today. What made it even more incredible was the fact that Battle Hero (stablename “Bart”) had “quartered” (sliced the back of) his heel just a few days before in his stable and looked a certainty to be scratched. It was down to the wire of whether he would actually get to the race and the stable worked tirelessly to get him free of pain and ready to go and the decision to run was only made early this morning!! Jumping from the inside barrier, Bart was expected by many to settle behind the hot pace, however, both jockey and horse had a different plan and he burrowed through to take up the lead. 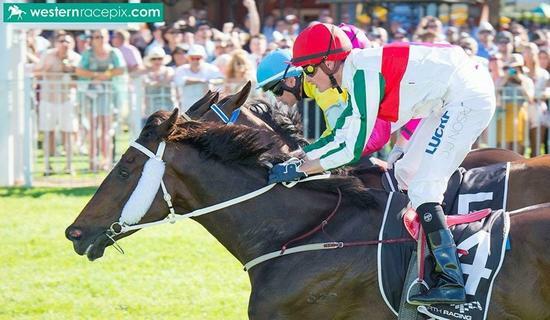 In a master stroke by stable jockey Jarrad Noske, he kicked Bart well clear of the chasing pack early in the straight and although he was getting tired on the line, he held on well for victory against some of the State’s leading sprinters. His time of 57.7secs for the 1000m was a sizzler and reinforced his quality, particularly as he was first up from a spell. Battle Hero was purchased for a great price at a disbursal sale from leading owner Bob Peters a few months ago and many believed he was past his prime, however, the stable had the belief that they could rejuvenate him back to his best. Today’s win alongside a 3rd in his first run for GR has meant that he has already returned his purchase price and been a great buy for many of the stable’s loyal owners and a couple of first timers!! Based on today, he is going to give them all a lot of fun in the big sprint races in the coming months.